Ultra fine Titanium micro labrets and monroe studs. Great for facial or ear piercings where you need an ultra fine, thin micro labret. 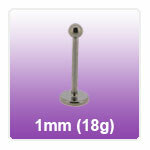 These 1mm 18 gauge labrets are made from 6AL-4V Tianium and are supplied with 2.5mm ball. Available in lengths of 5mm, 6mm, 7mm, 8mm or 10mm with a 5mm bottom disc. We offer these with either a Highly Polished or colour anodised finish. "I have placed several orders, and each order is sent out super quick, and the jewellery is of top notch standard. I would highly recommend to..."
"I've used Jobananas twice now and I couldn't fault them at all. Very fast, reliable and efficient. Will continue to use them and will also happily..."
"very pleased with the 8mm balls they look very good on me"
"Super quick delivery- smooth from start to finish"